Whether you’re using the standard tuning, dropped D, DADGAD, or actually have no idea what I’m talking about, keeping your guitar in tune is more often than not a slow, dull process that can often take longer than it needs to, even if you’re amazing at it. 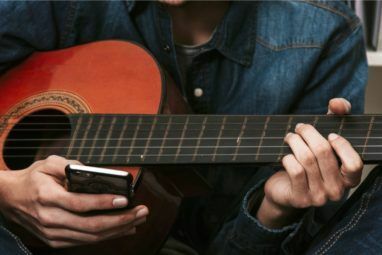 Fortunately, technology has come to the rescue in recent years, with various apps and tools released that help you tune your guitar. They won’t turn you into Jimi Hendrix, but they’ll make focussing playing a lot easier. While many people are capable of playing a musical instrument, not all of us carry a low E around in our heads. 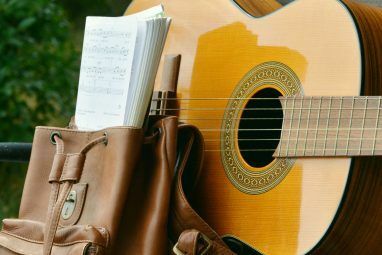 As a result, the most common way of tuning a guitar was to play a favorite record, play along, and work out where the guitar was out, and retune from there. This would involve “tuning the guitar to itself” which essentially means that the differences between the strings are kept the same as they would be if the guitar was tuned to EADGBE (the standard tuning), even if the guitar itself is tuned as FA#D#G#CF. With the guitar tuned in this way, you can at least be confident that things will sound “in tune” if not necessarily in the right key. Playing a few chords 4 Awesome Websites To Find Guitar Chords For Songs 4 Awesome Websites To Find Guitar Chords For Songs Read More will help you work out what strings need further adjustment. Guitar tuners used to be quite expensive, particularly in the analogue days when they were all about tuning each string to get a wavy pointer to hit the middle of a chart. Fortunately, digital guitar tuners came along, and while not initially cheaper, they proved really useful and getting a quicker result. Modern guitar tuners are extremely compact, able to sit in the palm of your hand. Often they’re clipped to the headstock (the area of the instrument furthest from you, at the end of the neck), such as this tuner from famed guitar builder Fender. Reliable guitar tuners can be picked up at for as little as $10 from Amazon. A guitar tuner is, of course, yet another piece of hardware to carry around. A much better option is to take advantage of a piece of powerful technology that you probably already have in your pocket – your smartphone! Guitar tuning apps go back years to the old Windows Mobile (pre-dating iPhone), and are one of the earliest examples of mobile apps. They essentially turn your phone into a guitar tuner, taking advantage of the device microphone. Many good guitar tuning apps are available on all platforms. Android users should start with PitchLab Guitar Tuner (LITE) [No longer available], which will do the job reliably. If you run into any problems with it, however, plenty of alternatives are available. iPhone users, meanwhile, might take a look at Guitar Tuna (also available on Android), which – happily – is also free. The App Store also has a good choice of apps to help you learn to play guitar 5+ Free Apps To Help You Learn & Play Guitar [iOS] 5+ Free Apps To Help You Learn & Play Guitar [iOS] If you’re a keen guitarist with an iPhone, iPad or similar, then you may or may not be aware of the plethora of apps aimed at musicians out there. 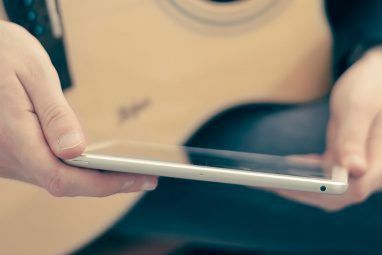 Some apps can be quite expensive,... Read More , and if you’re thinking about connecting your guitar to an iPhone or iPad, check our list of connectors Hooking Up a Guitar to Your iPhone or iPad: What Are Your Options? Hooking Up a Guitar to Your iPhone or iPad: What Are Your Options? You can plug your guitar into your iPad or iPhone to record, process or simply capture inspiration as it comes to you, but you'll need to invest in a guitar interface. Read More . 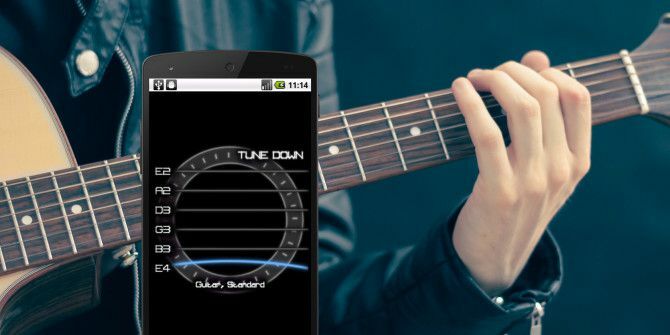 Guitar tuners are also available for Windows Phone. Guitar tuners are often used by bands playing live; either that, or they avoid any songs that involve dropping the tuning! But this can lead to a pause in proceedings while time is taken to retune, or a secondary guitar with the required tuning is picked up and plugged in. Legendary manufacturer Gibson recently added auto tuning technology to their guitars, a system known as G-Force which features six lightweight servos capable of quickly tuning each string up or down. The result is some very fast guitar retuning. A couple of things are worth noting. First, you wouldn’t use this if you don’t know how to tune a guitar. Second, G-Force is a system that puts your guitar in tune – after that, you’re on your own. It doesn’t retune what you play or anything like this. The only digital aspect to it is in measuring the tension of the strings, and ensuring the guitar is in tune; everything else is mechanical. G-Force doesn’t just give you standard tuning either; DADGAD, whole step down, drop D, E flat, double drop D and open turnings are also available, as well as space to save your own custom tunings, either from scratch or perhaps by combining two existing tunings. Additionally, the G-Force system can detect a capo in the 1st-6th fret range and tune your ax while taking the capo position into account. As an example of modern technology making a positive improvement in traditional music making, G-Force surely tops the lot. It also proves useful for quickly retuning your guitar to play Rocksmith 2014, one of the amazing post-plastic guitar music video games The Future Of Music Games In A Post-Plastic-Guitar World The Future Of Music Games In A Post-Plastic-Guitar World Like trends tend to do, our plastic instruments have fallen out of favor. This doesn't mean the intersection of music and games has been abandoned. These six new and upcoming titles. Read More . How Do YOU Stay in Tune? We’ve shown you six ways to retune your guitar using apps and hardware. But how do you keep your six- or twelve-string (or seven if you’re a big Steve Vai fan!) in tune? Tell us in the comments. I use the Roadie tuner - available on amazon. Works with an app conncected via bluetooth. It automatically turns the peg to tune it.